A few days after the musical premiered at the Landestheater, I was walking along the sparkling Salzach River with the von Trapp family. (How cool is that?) We passed a cylindrical billboard, plastered with an enormous ad for a new exhibition about to open at the City Museum of Salzburg (photo, above). Johannes von Trapp, the family patriarch and the youngest of the original Trapp Family Singers, stopped in his tracks. He blinked and swallowed hard, and little wonder: staring back at him from the billboard was an image of himself as a little boy. The City Museum of Salzburg, prompted by the stage premiere of THE SOUND OF MUSIC, has opened an exhibit entitled: THE VON TRAPP FAMILY -- REALITY AND "THE SOUND OF MUSIC." The billboard, advertising the new exhibit, featured a photo of the Trapp Family Singers from circa 1945, with little Johannes front and center. On November 1, I joined the von Trapps at the formal opening of the exhibition, which is slated to run through November 2012 at least. An artful blend of fact & fiction, the first half of the exhibit chronicles the real life story of the von Trapp family, with amazing artifacts such as Georg von Trapp's military uniform from WWI, and Maria's actual guitar, plus interactive computer displays that track the story from Austria to America, and the publication of Maria’s best-selling autobiography. Fiction picks up where fact leaves off: the exhibit details the making of the popular German film, DIE TRAPP FAMILIE, which first dramatized Maria’s story. The exhibit then turns its full attention to THE SOUND OF MUSIC. 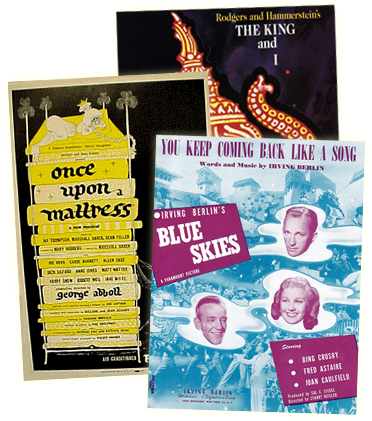 Working with this Organization, the exhibit focuses on the stage musical, from the original 1959 Broadway production starring Mary Martin to the recent hugely successful UK version produced by Andrew Lloyd Webber, and even to the newest production, which opened in Moscow just a few weeks ago. Artful displays feature rare playbills and LP's from the original Broadway run; set models from the '06 Lloyd Webber production, as well as an actual costume worn by star Connie Fisher in that version; and photos from productions over the years. An especially popular touch-screen console features "My Favorite Things" in nearly 20 different languages. (Guests are able to click on the screen and hear the song in Japanese, Hebrew, Portugese, Greek, Icelandic...) The exhibit also features displays on the Salzburg Marionette version, and even designs and models from the just-opened Landestheater. The opening of the exhibition was, in its own way, as moving and profound as the opening of the musical at the Landestheater less than two weeks earlier. The Salzburg City Museum is housed in a 400-year old palace once owned by an Archbishop; high above the palace is the "Glockenspiel" (bell tower), one of the most beloved landmarks in Salzburg. For hundreds of years, the Glockenspiel has pealed melodies by Mozart and other classical gems, three times a day, every day; Salzburgers listen for her bells, since the melodies change every month. We gathered in the Grand Hall, just below the Glockenspiel. The Governor of the State and the Mayor of the City each spoke about the importance of THE SOUND OF MUSIC to Salzburg. State Vice Governor Wilfried Haslauer told his fellow Salzburgers that they should be proud of three musical gifts Salzburg has given the world: Mozart; "Silent Night"...and THE SOUND OF MUSIC. He also spoke of the fact that Salzburg, in essence, was finally discovering the musical that the rest of the world knows, and he said that part of his community's reluctance to accept the musical was its reluctance to discuss its own past. He hoped that, in its own way, this production would be part of the process in which younger generations of Austrians confront their own history. A choir of Austrian children was gathered to sing for us, and looked utterly wonderful in their lederhosen and dirndl (noting that these are not "costumes" but rather, folk dress that they still wear for special occasions.) Beautiful, innocent voices of children serenaded us with songs from THE SOUND OF MUSIC -- in German. I stole a glance over at the von Trapp family; they were as moved as I. Actually, we all were in tears even a few minutes before that, when the evening began. Gathered in the hall, with speakers about to speak, and the children about to sing, we were first asked for total quiet. It was 7PM. In the silence, we could hear bells; they were coming from outside, and above. It was playing a new melody.